DaMaDa's music is based primarily on Chinese minority tribes (such as Miaozu, Zhuangzu, Yi Zu, Xinjiang and northwest chinese) folk songs combined with american free jazz style interpretations. The vocalist and dancer, Luo Danna grew up and was trained in China as a singer/dancer/actress and worked as part of a cadre that traveled throughout Guangxi and Guandong provinces of China performing. Guitarist Marc Schmitz and drummer Dave Mihaly are experienced San Francisco performers and composers who feel "at home" interpreting this music. DaMaDa also explores other Asian music such as Pakistani and Indian music in their own creative way. DaMaDa is a unique fusion of truly World Music. "3 Kingdoms" Reviewed by RadioIndy.com! 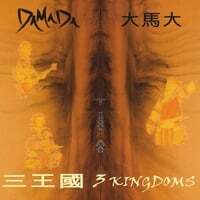 The talented group, DaMaDa, release their excellent Asian/World music CD, “3 Kingdoms.” This album is comprised of songs featuring the styles of Chinese Folk/Pop music and offers the vocal talents of Luo Danna who is accompanied by free style Jazz guitarist, Marc Schmitz, and drummer, Dave Mihaly. Danna sings with a soft and delicate clarity as she easily hits the upper register notes. The superb talents of Schmitz and Mihaly and their free style performances complement Danna’s wonderful voice. Starting the CD, the song, “Good Morning Miao Mountain,” is uplifting as it has a bouncy beat and grooves with a fun loving vibe. Another song, “Wan Wan De Yue Liang,” is a softer song and has expressive lyrics which Danna sings with emotive sensitivity. This group also explores the musical styles of Middle Eastern intonation as you will hear on the song, “Sun Drum.” Fans of Asian World music will find the terrific album, “3 Kingdoms,” overflowing with a wonderful collection of Chinese Folk/Pop music.